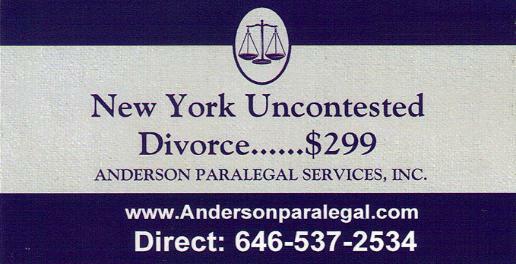 Anderson Paralegal Services ("APS") is a professional paralegal company, with the Founder Mr.
New York Uncontested Divorces, starting at the low rate of $299. (within the NYC area), click here To Make An Appointment. as Pro Se Litigants. The services of APS are cost-efficient, affordable, and reliable! general public, in an effort to save you time and money! three important components are Education, Experience, and Compassion. BA in Criminology. Mr. Anderson is Certified by the State of New York as a Crime Victims Counselor. Mr.
Anderson is preparing for law school (in the near future) to obtain his J.D. Departments within the New York City and New Jersey region. departments, and to the general public in an effort to save you time and money. SEC, Department of Justice, New York Attorney's General Office, and other various regulatory bodies. into the lives of young people and adults who are hospitalized (as a result of their disability or illness) . AIDS. ), Children’s Hope Foundation, and the Starlight Foundation just to name a few. York City (and 2008 Presidential Candidate) Mr. Rudolph Giuliani. volunteers were chosen, and Mr. Anderson was one of the recipients to receive the prestigious award. volunteer work that has helped others”, along with a luncheon and picture taking with Mr. Giuliani. end of the day, simply helping others!"